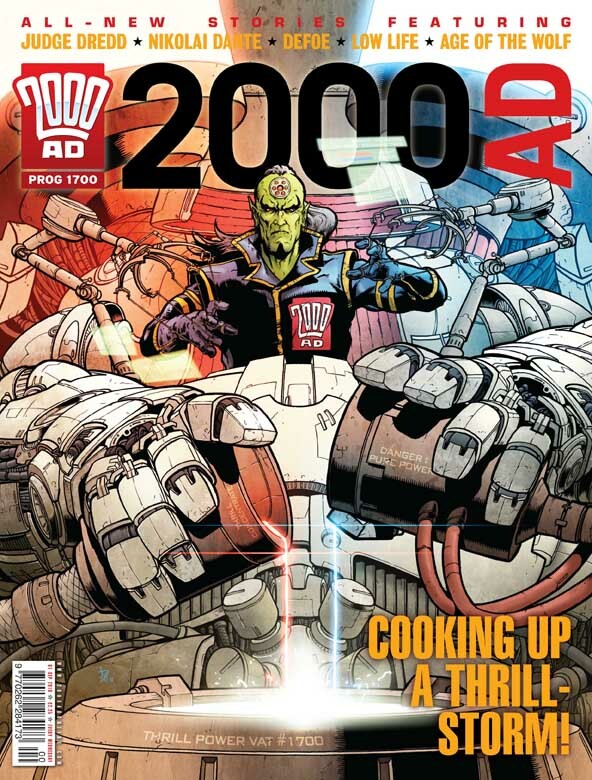 Bringing 2000AD into the post-manga world of comics! Rowan Morrigun - one of the Prog's more sensational character finds of the 2010s. Explosive gore. Super clean drawing. Bright and breezy colours. Given the first point, this might sound weird, but I find his work to be very child-friendly. Unlike some 2000AD artists, I’d have found it welcoming and delightful rather than scary/weird as a youngster. One of the more recent crop of droids who has gone on to regular status, Davis-Hunt got his first work in the Megazine, and delightful it was, too*. Which is just as well, as he had one of the more troubled introductions to the Prog in the form of Stalag 666, which is probably in many readers’ bottom 10 worst thrill list (if anyone could be bothered to generate such a list). Yet even here there are plenty of flashes of brilliance. What words could I add to this? It’s the sort of unforgettable image that I wanted to stare at for hours and then copy into my school folder (except I was already in my 30s and not going to school any more). The series as a whole isn’t exactly overloaded with this kind of sequence, but this level of imaginative and super-detailed extreme gore comes up reliably in a Davis-Hunt comic, and I for one welcome it with open arms and a wide grin. Tempest is first and foremost an action comic. Sure, it’s got the twisty plot that one has come to expect from Ewing, with dominoes set in place to topple, or not topple, depending on various hidden pieces. But mostly it has running, jumping and fighting. Davis-Hunt, from the off, emerged as rather good at fight choreography. On the other hand, he took a while to master the slower scenes, and this brings us to Stalag 666. 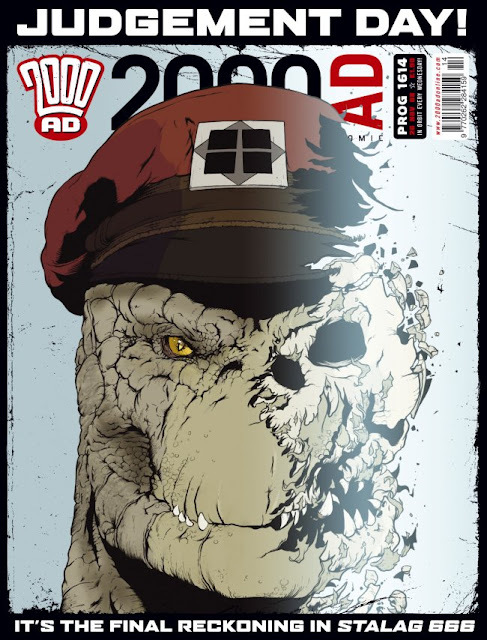 It’s a sci-fi prison escape tale, with a neat sideline in religious lizard baddies. But it also involves lots of scenes of people sitting or walking around and talking. It’s the combination of stilted/clichéd dialogue and static art that kills the strip (hampered too by some rather bland leading men). The actual plot and setting were perfectly good, to my mind. face-work hadn't quite come together at this point. Enough of the bad, what about the good? Well, it’s back to monster character design and my old friend, extreme gore. Davis-Hunt's evil nazi lizard design was outstanding. Bonus points for a bit of face-melting. Heck yeah! 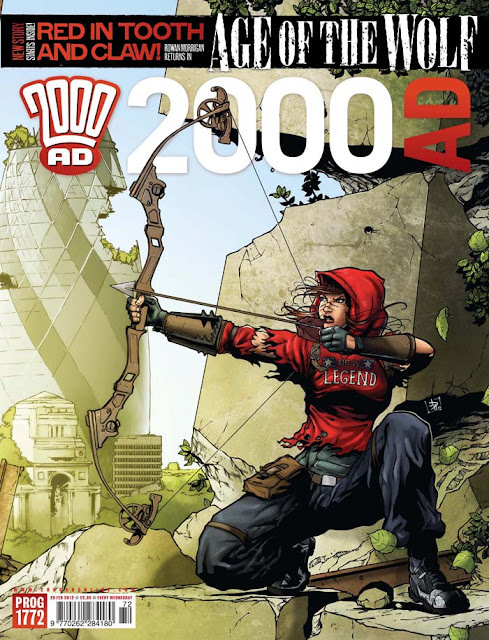 This is what us kids read 2000AD for - child-friendly gore. Somewhere, Kevin O'Neill is happily chucking his old white-out into a bin because censorship has been vanquished. It’s worth pointing out that despite this 18-rated visual detail, the overall tone of Davis-Hunt’s art – the line and the colours especially – are incredibly PG. It’s not a million miles from the Studio Ghibli look, just sumptuous and enticing and clean. The artist himself namechecks Katsuhiro Otomo in this Transformers interview and by golly anyone who dares to take on that master and even half succeed deserves high praise. It’s a style that he’s pushed and pushed as his career has gone on. That's how you do an aerial shot of Mega-City 1! Despite the incredibly poor reception that greeted Stalag 666, Tharg saw fit to give Davis-Hunt another chance, and the man himself showed a lot of perseverance in working to overcome his ‘faults’. Chiefly, this meant working hard on arranging characters within any given scene. Frankly, the early work had far too much of people’s upper bodies shown from a flat angle. Sure, angles for the sake of it can be distracting, but too much side-on stuff is just a bit wearing. At its best, Dandridge is a combo between classic-era Hollywood screwball AND slapstick combined. Wish we could get some more! and especially Age of the Wolf, which is brimming with strong character designs, action scenes and red, red gore. More crumbling face goodness. 80s goo-movie tastic! and pompous at the same time. And he's a werewolf! Now that's how to choreograph a cathartic act of violence! This and all above words by Alec Worley. If I was being mean, I could say that Stalag 666 was a mediocre story let down by sub-par art (with occasional bright patches), while Age of the Wolf was a mediocre story (mostly because I still find it confusing, even after 2 re-reads) elevated by top-notch art. So top-notch, in fact, that we’re probably going to get less Davis-Hunt goodness inside the Prog as he gets more work overseas. Covers will see us through, but I hold out hope for an explosive new series from the man when he’s reached the peak of his powers. *He’s also a rare example of a creator who started out in video games and then turned to pro comics work, rather than the other way around. Long may the fluidity continue!